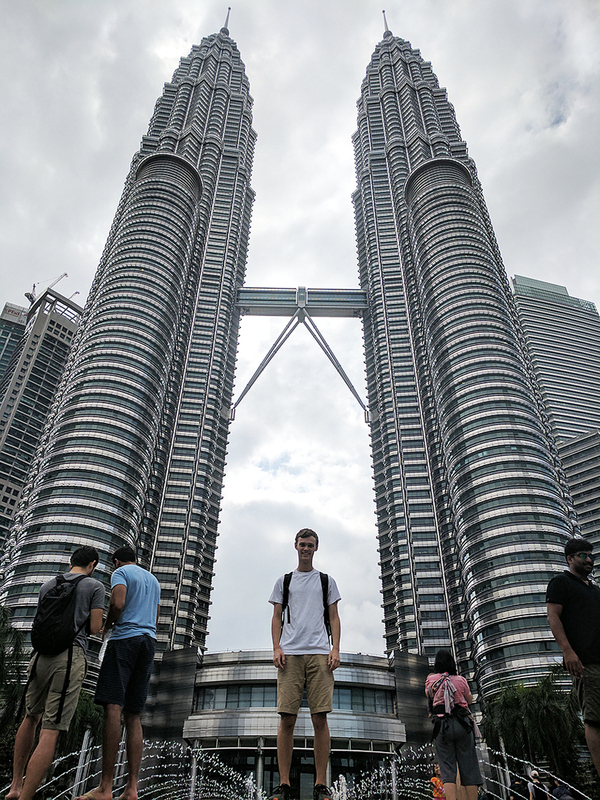 While studying abroad, Thomas Kittross spent a weekend in Kuala Lampur, Malaysia, where he visited the Petronas Towers (above), the Batu Caves, and sampled some of the best food he’d ever eaten at street stalls. If you ask Thomas Kittross about his most memorable experiences abroad last spring, set aside plenty of time to listen. There were that many of them! Camped on a beach in Hong Kong and swam that night among bioluminescent plankton that lit up when he touched them. Ate the “best sushi” in the world during a whirlwind trip through Japan over spring break, including stops in Toyko, Osaka, Kyoto, and Hiroshima. “I could go on and on for days about ‘particularly memorable experiences,’” Kittross says. It took some research on Kittross’s part to sort through all the different study abroad options. “There also are lots of forms to fill out and people to get approval from. So you need to be a little self motivated to go through the process,” he says. However, people like Ted Pagano in the University’s Center for Education Abroad, and John Lambropoulos, the chair of mechanical engineering, were happy to help him through of the process and answer questions. As a result, he was able to take two courses at HKUST that count toward his major and three others that count as electives. He also received a $2,000 University scholarship in addition to his usual financial aid. “First of all I gained a lot of knowledge about a culture I was relatively unfamiliar with,” Kittross says. “I also gained confidence in my own independence. “My top advice for other students thinking about studying abroad is simply to do it! If you are thinking about it but are unsure or it sounds scary, I promise it’s worth it. Click here to read the blog Kittross kept, full of photos and descriptions of his adventures while he was abroad. Hong Kong offered Kittross a variety of photo opportunities, from the brightly lit skyline to serene views of nature in the surrounding hills.